Mulch is another one of those things that make me wonder exactly when we lost our minds. Try as I might, as a child, I do not remember ever seeing anyone put mulch around their landscaping. In fact the closest thing I can recall was when putting white granite chips around plants was the “in” thing. These seemed like a great idea because rocks , as you know, tend to last for a while and they were supposed to help keep the weeds out. Sometime between my childhood and now (when we have definitely lost our minds about many things) some genius came up with the brilliant idea that rocks were “out” and mulch was “in.” Supposedly mulch is supposed to provide a protective cover and help with weed and moisture control and to promote the growth of the plants you want to grow. Now the real genius of the mulch business is that unlike rocks, the mulch breaks down every couple of years and has to be replaced. This is an even better angle than planned obsolescence, this is planned disappearance AND replacement! It has been a year or two since I have mulched and just as the corporate mulch cartel designed, mulch is virtually non-existent in my yard. 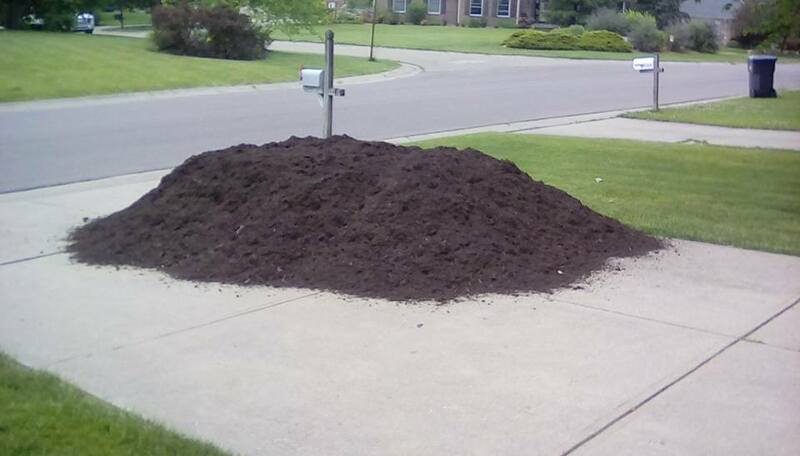 So, I figured that I better get my mulch up to standard before the petitions started going through the neighborhood. So, I decided it was time to grab my yard cart and shovel and get to mulching. Mulch is mulch, right? Just decide between black, brown and red, easy decision, right? Wrong! One website I visited lists 42 kinds of mulch – 42! (I can choose between 42 kinds of mulch but I only get two choices for President? Well, that is another story) Anyway, I’m not so interested in mulch that I want to learn the subtle differences in textures and scents of all 42. Being the dull, boring kind of guy that I am I simply went with the “twice shredded and processed hardwood mulch, very dark brown color.” Allegedly “Our best-selling mulch.” If it is the best-selling it must be good, right? It does make me wonder which is the 42nd best-selling mulch and why? So, I went online and ordered five yards of mulch. Now five yards does not really sound like that much, does it? Well, when they dumped it in my driveway, I thought it might cover my entire yard and the yards of five other houses around me. So last Friday evening and Saturday I mulched and I mulched and I mulched. Then I mulched some more. I mulched the plants at the front of the house, I mulched the plants on both sides of the house, I mulched the flower bed at the back of the yard, I mulched the island in the middle of front yard, I mulched the trees. I mulched on both sides of the deck. It occurred to me that spreading five yards of mulch is kind of like running a marathon. Both might sound like a good idea before you begin, finishing both provides a sense of accomplishment plus with both the fun is over long before you get to the end! Yet, little by little, bucket by bucket, yard cart by yard cart, the pile was slowly but surely whittled down and all the landscaping areas of my yard became a consistent dull brown. I learned that five yards is quite a bit of mulch. I learned that moving mulch requires muscles that I have not used in years. Perhaps this mulch breaks down and disappears maybe I’ll remember my childhood and get some of those white granite chips that will last forever. This entry was posted in Humor and tagged Mulch on June 21, 2016 by Leonard.